And here we are with another two episodes of that show that gives more action to the apostrophe than anything else ever made. We begin over a planet, where a Death Glider is under attack from a Ha’tak mothership while down below at the planet’s Stargate SG-1 are waiting after receiving a radio signal from what they believe is the Tok’ra. The Death Glider manages to make it to the surface and crash land near SG-1’s position, leading them to investigate where they find the Goa’uld Apophis heavily injured and asking for asylum from the Tau’ri. Despite the team having split views on the matter the incoming wave of Death Gliders forces them to take him to the SGC, where their arrival causes further discussion about what to do with him, with Fraiser winning the argument that he needs to be taken into surgery. After surgery they manage to stabilise the host but the symbiote is dying due to prolonged torture at the hands of another Goa’uld. The base is split between what to do next, with Fraiser and Carter both taking pity on him due to the pain he’s in while O’Neill and Teal’c take pleasure in seeing him in such a weakened state. Despite their feelings Hammond settles the matter by reminding them that he’s a prisoner of war and therefore has the rights therein, such as humane treatment. In the surgical room Apophis finally wakes and asks to see O’Neill, where they share some back and forth before Apophis reveals why he wanted to talk to him; offering the complete knowledge of the Goa’uld in exchange for a new host body. Despite refusing to agree to the offer Apophis still offers O’Neill basic information about the Goa’uld who attacked him, the Goa’uld known as Sokar who has deliberately cultivated the role as the Devil himself. An unexpected Gate activation, causing a greater reaction than usual due to their prisoner, leads them to making contact with the Tok’ra. Daniel decides to go talk to Apophis next, where Apophis deliberately antagonises him by talking about Sha’re causing Daniel to respond that it was he who took Apophis’ child back on Abydos. The continued arguing is stopped however by the arrival of the Tok’ra, led by Martouf, who inform them that word has gotten out that they took Apophis and that he needs to be returned immediately. Martouf’s symbiote Lantash quickly takes over and starts questioning the wisdom of treating Apophis to the same rules they’d treat other humans with and that they’re liable to get themselves killed in the process and get no useful information from Apophis. This is all rendered theoretical by Fraiser’s arrival who informs them that Apophis is dying, with the host experiencing rapid aging as a result. The collective group go to see Apophis so that Martouf can question him but Apophis is not only losing lucidity but also control of the host, with the host momentarily taking control and calling for help in ancient Egyptian. Once again the team are interrupted by a Gate activation and constant bombardments against the Gate. A hologram of a great face appears, Sokar himself, demanding that they return Apohpis or die before bombarding the Iris with a particle beam to heat it up until it melts away. Carter and Teal’c try to get information from Apophis but only reveals Sokar used the weapon against him before experiencing severe pain again. Carter leaves to get Fraiser, leaving Teal’c alone with his former master where he not only torments Apophis with the prospect of a growing Jaffa rebellion. Fraiser returns but Teal’c blocks her from providing pain relief so that he can take pleasure from watching him suffer before giving in to Fraiser’s demands. In the Gateroom the base is fast heating up, with Siler barely able to cool the Iris down with Liquid Nitrogen. Despite the 38 minute window finishing the SGC is unable to dial out faster than Sokar can dial in, giving the President no choice but to give in to Sokar’s terms and order the SGC to stop all medical treatment on Apophis as a result. O’Neill goes down to try and mentally torture Apophis further by telling him that they’re sending him back, only to get the frightened cries of the host in response. Daniel is summoned and quickly starts translating his story as a scribe who has been in a nightmare for several thousand years. With little choice left Daniel at least tries to provide comfort for the man by providing him last funeral rites. Apophis takes control one last time and expresses fear before finally succumbing, leaving the host barely alive. After performing last rites for him the host finally dies, leaving him able to be given back to Sokar, whose second attack on the base finally ends and this time, with a modified dialling program, they’re able to dial out quicker. After sending the body through Martouf reveals that Sokar has a Sarcophagus and will revive Apophis only to torture and kill him repeatedly but is confused by the solemn mood that the other members of SG-1, including O’Neill, express at the idea of anyone, even Apophis, suffering this fate. This episode largely exists as a commentary on the treatment of prisoners of war and the argument whether fundamental rights of fair treatment should be changed depending on what the prisoner has done. 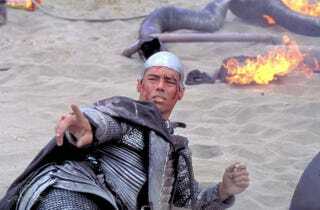 This is largely done through the conflicting efforts of the team where Daniel and Carter are willing, even if unhappy with it, to provide comfort for Apophis during his final hours while O’Neill and Teal’c, the more hardened veterans who’ve seen their enemies mistreat prisoners, believe that they shouldn’t give anything to him, with O’Neill going so far as to say they should’ve just killed him on the planet. Despite these initials positions however they end up through the course of the episode ending up in the same view that while they may think Apophis is a being of evil they all have the same grim view of him being tortured endlessly by Sokar for the sake of seeing him in agony, revealing that while the more hardened members of the team came across angry and bitter they still feel pity at seeing someone so defenceless. Teal’c however seems to be the exception of this however, taking nothing but glee from seeing Apophis in both mental and physical pain throughout the episode as he sees it as justice for what he was made to do while under his command, a theme explored back in season one’s Cor-ai. Overall though this episode is incredibly prescient and required as the treatment of not only POWs but also their leaders would become a long lasting issue on both sides of the Atlantic after the invasions of Afghanistan and Iraq that saw major stories emerge of rampant prisoner mistreatment at detention facilities and the removal of key rights due to political manipulations. · This has one of the coolest effect shots of the series with the camera backing through the Gate as O’Neill goes through and arriving just before him as if the cameraman went through the Gate. · I do like how we never know if Sokar deliberately created the idea of Satan or if he used it for his own utility. Quote of the episode: “Can’t help you there. That’s between you and your god. Oh, wait a minute. You are your god. That’s a problem.” –O’Neill. This episode begins with the team arriving inside a building full of strange objects of non-Goa’uld origin. Despite initial explorations the team are interrupted by the arrival of what appears to be a senile old man but Teal’c identifies him as Ma’chello, a well-known resistance fighter against the Goa’uld who he spent many years as First Prime trying to catch. The others however find this hard to believe when he simply repeats what Daniel and Carter say to him but eventually decides to Daniel one of his inventions, a device with two sets of handles that activates when they both grab it. Back on base both Daniel and Ma’chello are checked out by Fraiser, who observes that Daniel is acting strangely but doesn’t think much of it. Once cleared Daniel heads to the briefing to join the others where Carter is trying to decode some of Ma’chello’s inventions but Daniel tells Hammond that Fraiser told him to take some time off, with Hammond telling him to take a day off. Later at the SGC however the rest of SG-1 are brought to Ma’chello who claims he is actually Daniel and that the device switched their minds, proving this by answering their questions. Fraiser has no way to understand what is going on and fears for Daniel due to the state Ma’chello’s body is in, with O’Neill instead suggesting they go back to the planet and bring back the object. Despite placing blocks over the handles to avoid touching it Teal’c and O’Neill are switched by the device upon touching it. Out in Colorado Springs Ma’chello is trying to understand the world, acting by our standards strangely by going up to strangers and calling them ‘friend’. He runs into a homeless man called Fred with whom he quickly strikes up a rapport, agreeing that they’ll both ‘feast on him’ at a local diner, where he also pays for everyone else as well. While eating Fred deduces that Ma’chello is a war veteran where Ma’chello reveals that he was tortured and everyone he cared for killed by the Goa’uld and now wants to live the good life but Fred warns him that all things must come to an end. This prediction quickly comes true with Ma’chello being arrested after leaving the diner, but manages to say farewell to his friend first. In the lab Carter decides to use O’Neill and Teal’c as guinea pigs to try and find a way to revert back, saving them time once they find Ma’chello. Despite multiple attempts they don’t manage to reverse the attempts while O’Neill is starting to feel unwell in Teal’c’s body, meaning he has an infection and that the Symbiote can’t help until O’Neill puts himself in a state of kelno’reem, a meditative like state, but O’Neill has no idea how to do it. With instruction from Teal’c O’Neill manages to reach kelno’reem and heal his body but ends ups arguing with him when Teal’c attempts to shave O’Neill’s head. At the SGC they bring in Ma’chello, with Daniel close to death already, and demand he reverse the change but is unable to do so, with any change being permanent. Despite willing to give away his knowledge to Carter Ma’chello is still uncaring towards Daniel’s situation, believing him to be a needed sacrifice to continue his work against the Goa’uld and that his new body is his reward for his previous fight against the Goa’uld. Upon talking however they both have more shared experiences than they realised, with Ma’chello stating he would go back if able but doesn’t know how. Carter on the other hand works out that you can switch everyone back but only via different combinations each time and is able to restore everyone to where they belong. Despite previously being catatonic Ma’chello wakes up one more time, thanking Daniel for ‘the holiday’. This has always been an interesting episode as it not only features an antagonist who really isn’t that antagonistic but is also a very sympathetic character, with Ma’chello providing a reflection of the treatment of war veterans from recent conflicts, including the then still recent Gulf War, with him being ostracised and feeling that what he did has been ignored by the public. This goes so far to him feeling that he deserves Daniel’s body by right initially as he believes himself more worthy as a fighter than an archaeologist and it’s only upon talking to Daniel that he realises that just because he did fight on his behalf it doesn’t mean he gets carte blanche to do as he pleases now. The episode balances this out however by having Teal’c and O’Neill also switch and provide a more comical view on the switch as opposed to Daniel’s life and death situation, with us being able to watch the rare sight of Christopher Judge actually showing emotion and pulling off a very good impression of RDA in the process, with his actions when Teal’c tries to shave O’Neill’s head a standout moment of the episode. Overall this is a nice little episode where you see the main cast acting as each other (though in Michael Shanks case he’s playing two characters who switch) and lets us see them playing different roles in the team for once against the backdrop of whether the public let down returning troops in day to day life or whether some troops expect too much from wider society. · Ma’chello’s hideaway totally isn’t the set from The Fifth Race. No sirree. · Why didn’t they just pick up the device by something other than the handles? Could’ve stopped many of the problems in the episode. Quote of the episode: “If it was not for me, you would have been conquered by now.” “By who? Saddam?” “He is not a System Lord I am familiar with.” –Ma’chello and Fred.